SF Canada founding President, Candas Jane Dorsey, was for over 45 years—and continues to be—an award-winning author, editor, publisher, organizer, university teacher, mentor and activist who grew Edmonton’s literary scene and helped found Canada’s cohesive SF community. 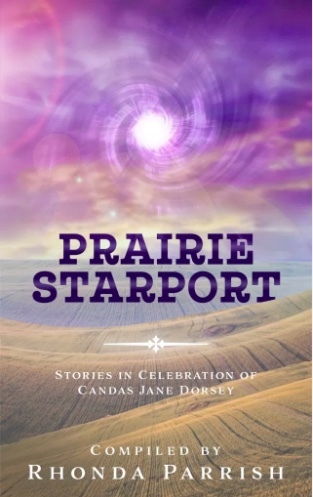 To honour Dorsey’s astonishing career, Rhonda Parrish has compiled a unique tribute anthology: Prairie Starport: Stories in Celebration of Candas Jane Dorsey. The collection includes stories and tribute essays by authors and editors mentored by Dorsey. Contributors include Timothy J. Anderson, Greg Bechtel, Eileen Bell, Gregg Chamberlain, Alexandrea Flynn and Annalise Glinker, Barb Galler-Smith, Anita Jenkins, Laina Kelly, John Park, Rhonda Parrish, Ursula Pflug, Robert Runté, Diane L. Walton, BD Wilson and S.G. Wong.